Under the guise of Locked Room International, John Pugmire has been providing English translations of (among others) Paul Halter’s impossible crime novels for a few years now, and there can be little more fitting than his latest effort as the opening salvo in my cataloguing of the undoable provably done. It really is time we started appreciating Halter on his own terms, so let’s mention John Dickson Carr now – hey, I adore the man, so don’t think I’m being dismissive – and look at what makes Halter stand apart. Carr undoubtedly revolutionised the impossible crime/locked room genre and left a wake that it’s sill virtually impossible to sail in these waters without disturbing, but Halter is increasingly showing himself capable of the impossible. After some nice touchstones in the earlier LRI works – murderers leaving no footprints in snow or mud (The Lord of Misrule/The Seven Wonders of Crime), impossible body-swaps in locked rooms (The Fourth Door) – we’re now getting to see a greater diversity in Halter’s imagination and smoothness in his realisation. The ‘murder by genie’ in The Tiger’s Head was a lovely riff, the central idea of The Crimson Fog was superbly realised (please don’t find out what it is in advance, you really should read the book in total ignorance), and now The Phantom Passage goes even futher. If the idea of an invisible event applies anywhere, it’s here. The grandest game in the world has been making things disappear for decades – bodies, murderers, murder weapons, valuable jewellery or pottery or paintings, horse-drawn coaches, even a house – but here it’s an entire alleyway (or, indeed, passage). Usually announcing its presence to the unwary, these poor souls enter, experience a terrifying vision of murder and – if they’re lucky – stumble out to find the passage has disappeared behind them. If they’re not lucky, they might not even make it out at all… There are naturally several more layers of complication on top of that but, even while things start out confusingly, there’s no risk of Halter deliberately giving woolly and unsatisfying descriptions so that he can wave his hands in the air and go “Woooo! Er, something like this?”. A little patience will reveal a very clear picture of what is going on, but you’re still going to have a torrid time trying to explain it! Owen Burns remains a compellingly different type of detective, not necessarily on account of his aesthetic appreciation as much as the feeling that he really doesn’t possess the usual omniscience. His being a fairly young man actually works very well when presented with his, uh, less than fully-rounded character as it gives him a naivety and an unsullied air that fits his methods superbly. The early 20th century setting is farily successfully realised, and the fog-soaked sojourns into the London alleyways are very effective, but pretty much everything is plot with Halter and the plot really is fabulous. Another sharp and light translation from John Pugmire also helps, of course, and it’s wonderful to watch this unfurl as gracefully as it does, and to have it kick you in the ribs a few times along the way. 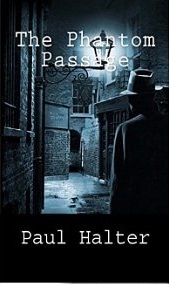 Pingback: The Phantom Passage by Paul Halter – Mysteries Ahoy! So long ago that there aren’t any comments! Anyway, I have just finished this, and it’s fresh in my mind. Very enjoyable – definitely preferred it to Death Invites You. Moves at a real clip, no incident wasted. The solution is indeed great, and it’s wonderful to watch all the pieces fit into place. I enjoyed the atmosphere of the whole thing. The motivation for these strange events is of course ridiculous, but it’s of a piece with the rest of the book. The only downside I found was the detective, who seems like a total arse. I disagree that he doesn’t seem omniscient. There seems to be some kind of attempt at a Watson/Holmes dynamic, except without any of the warmth. Not that he was unbearable, just annoying. I esepcially liked the final line of this one, as it ties into Halter’s penchant for a last-minute surprise and also ties up a significant proportion of the preceding plot. Yes, the motiation is ridiculous, but the whole thing is ridiculous — it’s about the creativity and chutzpah of being able to pull out this sort of problem and then explain it away so simply and rationally. Halter needs more credit for the brilliance of how he does this time and again. I do (slightly) prefer the Twist/Hurst dynamic of those books to the Burns/Stock here. Indeed, but for these being writtne in French I would presume that the naming of Stock was a joke because he’s such a “stock” character. But then, I’m not into Halter for the subtle ways his manipulation of character throws new light upon the Holmes-Watson dynamic; I just want him to give me a baffling impossibilitiy and resolve it in a clear-sighted and brilliant way. And he does that, time and time again…!